One of the most desirable things I've seen recently and couldn't get is Orgone Accumulator standalone box, made by Batchas. It would be amazing to have such a size/format unit to work with samples. Also, I've heard about Clouds adaptation for Buchla format (which is not so BB friendly, and too much interesting... ), maybe something for Serge systems also existed. The last thing I would say - such a tool shouldn't replace regular sampler, or be as complex as computer tools. I see it more as an experimental tool for "musique concrete", "tape music" work in a modular environment. perhaps a gotharman little deformer with the banana expander box? i never really got along with the interface/hierarchy of the thing, but the potential is quite high for real time interaction with a system, i think. octatrack is quite good for some things like this as well, but does not have CV control. you can setup some pretty complex and weird looping "patches" on the OT... as you can literally have 8 loopers feeding off 4 inputs simultaneously. lots of potential there as well. i would personally love a sampling/sample playback module in bugland, but i don't think that's really tom's bag. Interesting thread. I'll soon be incorporating Radio Music on a mostly BugBrand system but probably won't do more than filter it. Grain stuff tends to remind me of the worst aspects of early digital audio. Doesn't float my boat although the concept is very appealing. 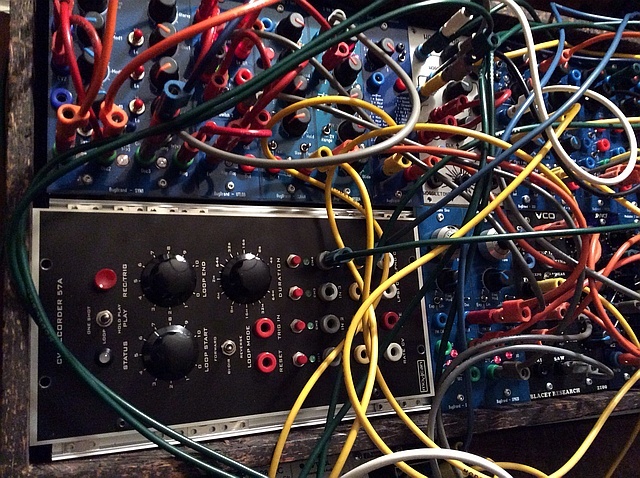 I think keeping it in a Bugs modular would inevitably have to involve something DIY. Mention of a Radio Music is interesting. That fed into the CV Recorder could be fun. Tajnost: Funny you should mention that. The A format one kind of fits right in. Huge though. Got some good sounds that way, mostly from drastically slowing down glitchy sounds to find rhythmic clockwork sounds. The A format one kind of fits right in. Huge though. Oh - the number of times I've said to myself - "I wish the CV Recorder PCB didn't stick out so far!" That must be quite a deep case you have there? Yes. The case was 36" wide and 6.5" deep to fit even the deepest Blacet stuff. Quite a monster. Would be interesting to hear / see some examples with this Modcan CV recorder! Live recordings from that setup. Active switches helped manage the 57A. The uses in first two are pretty obvious. There's some in the third one but it's mostly fun for other reasons. gotta have a phat wallet!